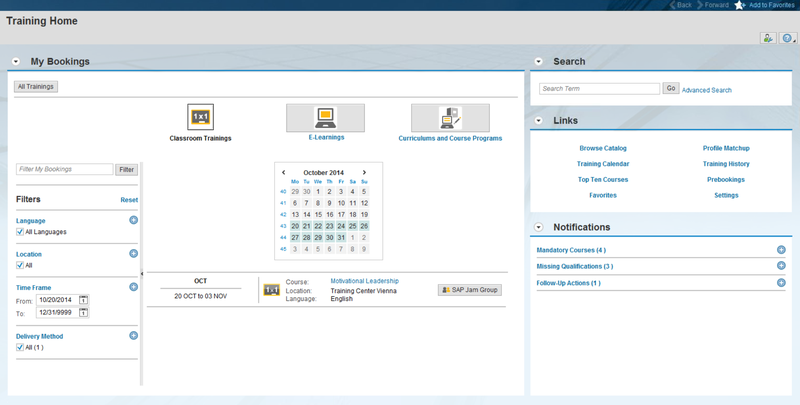 For many companies SAP Learning Solution is the software of choice when it comes to learning and personnel development. As powerful as the SAP Learning Solution may be, its main focus remains on the formal training process. However to leverage all possibilities and complete the learning mix, employees should be supplied with tools that support informal and social learning. 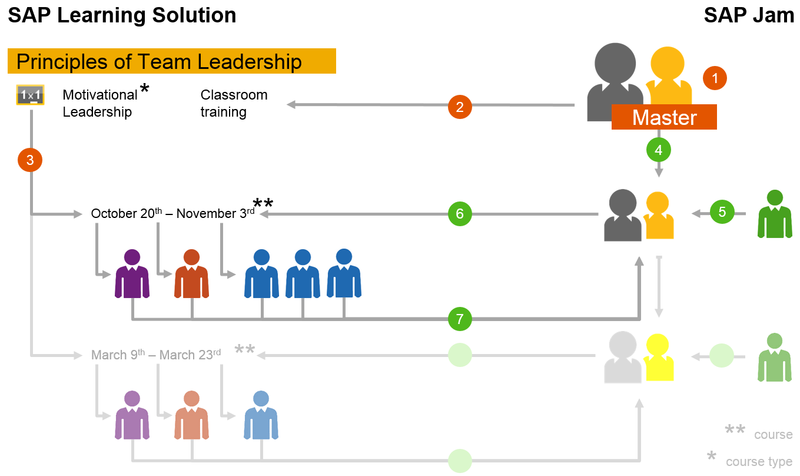 From an SAP perspective the obvious tool here is SAP Jam as it imparts all of the great features to connect employees and allow them to collaborate and share their knowledge in order to do their jobs better. So now there are two separate software products covering the learning needs from both sides, formal and informal. The good news here, is that these applications don’t work isolated – they work in an integrated way while leveraging the individual strength. Let’s have a look at the second scenario in this post. In difference to the above the following scenario explains how the dedicated learning group is much more tied to the life cycle of the classroom training. Therefore such learning groups are not available for time-independent delivery methods. The goal is to provide learners, tutors, course administrators and instructors a private learning group for a single course event. 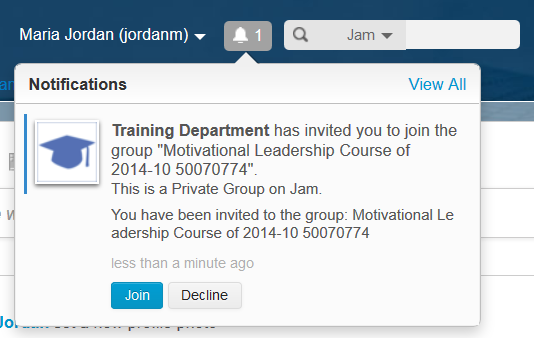 Either the tutor or the course administrator created a group on SAP Jam (1). This group is not used for the actual collaboration. It is rather the master group that will be used as a copy template. This master group will be assigned to the course type using new attributes based on the Jam group ID (2). As this integration is much more tied to the course life cycle, the course administrator can maintain rules for “start of collaboration” and “end of collaboration”. This way, administrators can define when a member of each role should join the group. Even an automatic “clean up” after the course ends is possible. In addition administrators are in a position to determine the role of the tutor / instructor within the SAP Jam group. This is particularly useful if learners shouldn’t have access to all documents stored in the learning group. If tutors and instructors join as group administrators they will have access to all private folders by default. There is no need to maintain this on an event basis. After these settings have been maintained on the course type level there are no manual activities required in the day to day workflow to bring this integration to life. 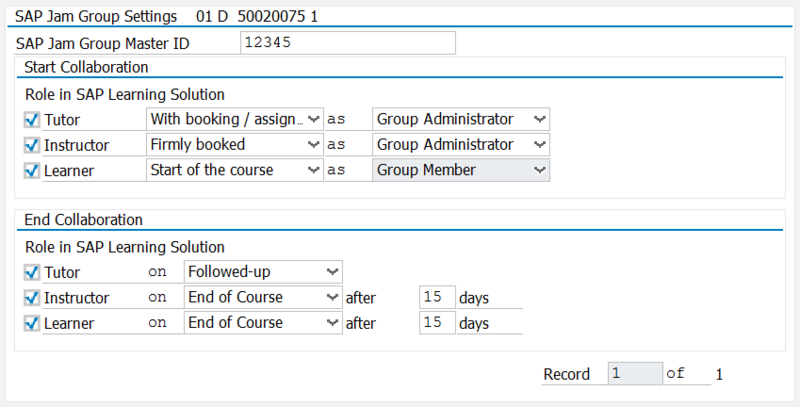 If a course is scheduled (3) the system automatically copies the master group (4), adds the responsible course administrator as group administrator (5) and assigns the newly created group as the actual individual learning group to the course (6). By leveraging the copy mechanism all content stored in the master group and almost all settings such as group description and profile picture are replicated. This implementation is much more efficient than starting from scratch or applying a native group template for each course event. Now the tutors, instructors and learners will receive an invitation to join the group at different points in time dependent on the settings maintained for the particular course type (7). 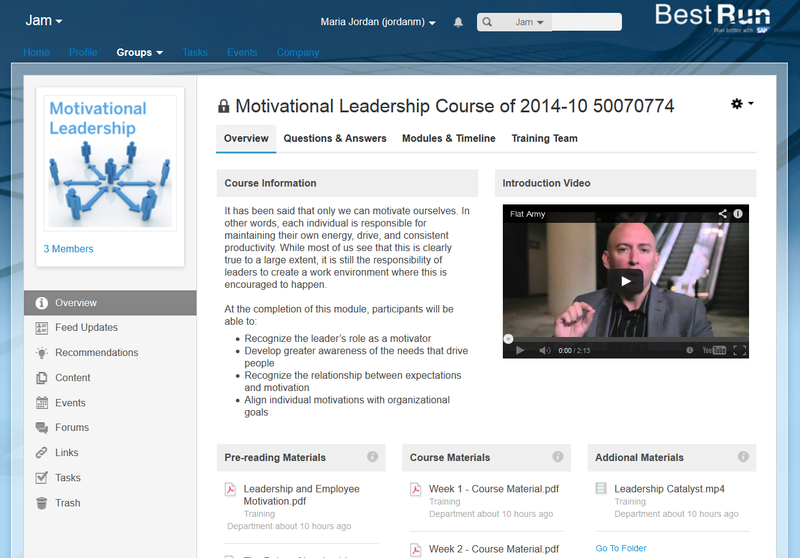 Similar to the first scenario – employees can jump to the event-specific learning group using a button on the training home page and a link on the course detail page. After the course ends the system automatically revokes the access of certain users if this is the desired behavior. The second integration scenario really focuses on the formal time-dependent course, providing all the functionality of SAP Jam to enrich the learning experience. It can offer further support for course administrators as they can post event specific information like recommended hotels or the menu of the canteen. Even more important, the course administrator can assign a task to the instructor. This could be the task to fill out the attached attendance sheet at the last day of the course. Once the integration is set up there are sure a lot more administrator’ supporting use cases to be found. It should come as no surprise now, that the processes for cancellations or any change to the tutor and instructor assignment have been automated. In case the entire course is cancelled the individual learning group will be deleted as it has become obsolete. Should the booking of a learner be cancelled the access is revoked almost immediately. The same logic applies to instructors and tutors. The aim was to develop these services in such way, that course administrators won’t have to do any manual steps to ensure that only relevant persons can access the learning group. This post is also available on the SAP Community Network.